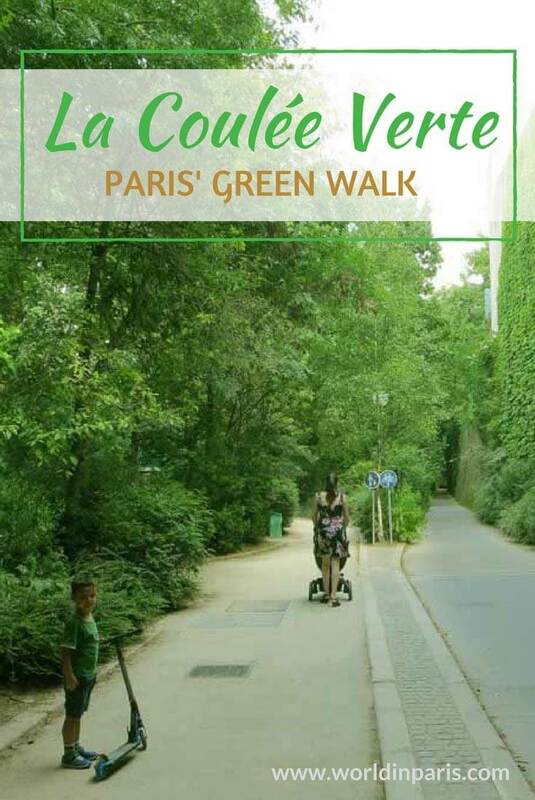 Few Parisians know about la Coulée Verte (also known as Promenade Plantée), located in the 12th District of Paris. It is a pity because this is one of the most beautiful Paris walks and a good way to escape the hassle of Paris without leaving the city. La Coulée Verte links Bastille Square to Porte Dorée and Bois de Vincennes, following part of the ancient railway (la Petite Ceinture) which stopped working in 1969. This 4,5 km nature walk car-free is a world apart, crossing tunnels, trenches, and long bridges. We like to do this walk in summer, to escape the high temperatures, or in autumn for its colors. Pictures on this post were taken in July and October. We have split this stroll into different parts. For each part, we indicate the distance, the closest metro station and the closest Vélib station (only the first part can be done by bike). We start our walk at Rue de Sahel but you can join where you want thanks to its stairs and lifts all along the way. We start walking la Coulée Verte through Rue de Sahel /Avenue du General Michel Bizot. After walking some meters we enter the part built in a trench, leaving the hassle of the city above us. This is a beautiful part, my favorite part, very green and with lush vegetation. A double path allows people to do it by foot or by bike. The path crosses two short tunnels nice illuminated. This part ends with a third long tunnel, le Tunnel de Reuilly. At the end of this tunnel, we are again at the same level than the streets of Paris. Click here to Download this Self-Guided Tour for FREE now! Allée Vivaldi is a kind of pedestrian avenue with trees all along its way. We like to walk it in autumn because of the colors of the trees. Along this avenue, we can see the ancient Reuilly train station, which was served by la Petite Ceinture. You can see below how it looked like when the ancient railway was still working. Today the building is used for social events. At the end of this alley, we need to climb some stairs to reach the bridge which crosses Reuilly Garden. This is another cool part of la Coulée Verte because here we are walking 7 m above Jardin de Reuilly, through an elevated walkway. Maybe this part of the path reminds you of New York’s high-line? Well, you are right, the Promenade Plantée was its source of inspiration. In summertime Jardin de Reuilly is packed with people enjoying a picnic or sunbathing while in autumn this garden is only enjoyed by some lonely walkers. This is the last part of our stroll. We are always walking along an elevated garden 7 m above the street level. Sometimes we even go through the buildings! I like to describe this part as a hanging garden with some water bodies, different kind of flowers and plants and some shady spots to take a break. This part is also cool because you can see Paris from another point of view, we are very close to the city’s roofs! 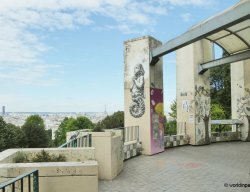 When you’ve finished enjoying the gardens, go down to the street level and wander along the Viaduc des Arts. This is the ancient Viaduct de Bastille, built to support the railway line Paris – Bastille – Vincennes. At the beginning of the 80’s the City Council decided to restore this place and dedicate it to Arts & Crafts. And that’s what you see today: ateliers, workshops, cute cafes, and galleries have taken up residence in the vaulted arches below the garden. When you have seen this part, it’s time to go to Bastille Square and the streets around for a more than deserved drink. Did you like this walk? Are there similar walks in your city? I’m a huge fan of gardens and greeneries. This place perfectly fits the bill! I wouldn’t mind walking around here for hours. Or perhaps have a lovely date with a book. I’ve been to Paris twice now and had no idea this existed! And how cool that New York’s high-line was modeled after Promenade Plantee. I’ll definitely add it to my list of things to do next time I’m in Paris; it looks so beautiful and peaceful! It is, it is!! I am sure you will enjoy it a lot. So next time . . .
I’ve been to Paris a couple of times, but I seem to have missed this! So much greenery, what a lovely walk! I’ll have to make a note to remember Promenade Plantee on the next trip, and then Viaduct des Arts after we’ve finished in the gardens 🙂 Thanks! I am sure you will enjoy it, especially if you walk it during summer time. So refreshing! I’ve been to Paris so many times and had no idea there are such beautiful green places! Will have to explore this side of Paris next time I’m there. Thanks for sharing! What an amazing green space in the middle of such a bustling city! It would be so lovely to spend a couple of hours surrounded by nature without actually having to travel outside the city. The few Parisians that know about it must love having this area on their doorstep. This reminds me of the Trans-Pennine Trail which is near where I live. I love cycling or running along it and think I would feel the same about this place. I love that building with the sculptures on top. A little stroll wouldn’t hurt! or maybe run around these greens. I am a fan of parks and gardens. I always tend to be a watcher of people, observing them. It’d be awesome to walk here with a loved one as well, a girlfriend perhaps, and talk about just anything enjoying the scenery. Sweet! Thanks for sharing! To me it’s a good thing that few people know about the La Promenade Plantée or else it would be crowded and may make that bit about “escaping the city” impossible. It’s lovely though, and I can definitely imagine myself walking through there, to the view of all those greens, down to the tunnel. I have always wanted to go to France, it is my lifelong dream. When the universe takes me there (hopefully in the near future), I will take a walk to the promenade plantee for sure. We have always known Paris as a bustling city. Its great to know about such green places away from the hustle bustle to spend some peaceful time amidst the nature. Thanks for the post! I’ve always dreamt of going to Paris someday. Haven’t heard of this Promenade but definitely worth to visit! I love walking around and one day, I hope to see myself walking around this exquisitely beautiful place. 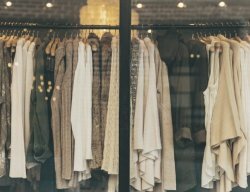 Never heard of this from other bloggers (maybe there are some write up) and friends. I like places unknown to many. I haven’t been to Paris yet, but will certainly take note of these places. I wonder how wonderful will it be during autumn, your photos are stunning. By the name itself Promenade Plantee sounds really refreshing. Who would not love to traipse their feet on this fresh and lively color green path, right? I would certainly visit this place when I get the chance to visit Paris. I actually just found out about this place, it is really interesting. Wow! The Promenade Plantee is lovely. Would love to stroll around there. It is a pity we missed it while in Paris. Will head there next time for sure. Thanks Vyjay for your kind comment. Good to read there will be a next time in Paris for you! How I really pity Parisians if they will not take advantage of this beautiful promenade. Not all mega cities in this world have something like this. I hope that people will see the importance of green spaces. Architects, Engineers and Urban planners believes that with more green spaces, people are more motivated to exercise which is great in fighting some diseases. I should have explored more. Such lovely scenes from the walk, very soothing and refreshing. I love finding areas of cities that aren’t all hustle and bustle. Love the pictures on this blog! I love how green it is during summer as shown in your photos, I can’t imagine how beautiful it is during autumn… Such a peaceful place, hope I can walk around Promenade Plantee also. How can Parisians overlook this place! Good thing you shared it here. I wouldn’t be clueless if I happen to find myself in a Paris tour some time in the future… Promenade Plantee! It’s now officially in my must-visit list! Absolutely amazing pictures! I love the gardens! So cool!!! This looks like a fabulous place for strolling around and enjoying nature. Promenade Plantée…such a sophisticated name, too. I love finding parks like this. I was surprised when you said that only few Parisians know about this part of Paris. How could be? This is a beautiful place to walk. A breath if fresh air. A different perspective to what we usually think about Paris. Hope more of your people could recognize this place and promote a clean and green city. So much green! Its great when cities bring in greenery to their parks. I especially love that wall of vines. I hope I can make it here during the spring so its full of life! A very pleasing landscape. I am always a fan of a nice horizon. It makes me calm. Indeed, Paris has a lot of nice places like this. My cousin is in Paris right now doing a leisure tour. I am jealous, I want to go there too. In the near future, I’ll visit and take nice pictures like these ones. Love the off the beaten path places. I think I could wander for days around here taking it all in. Nice areas to have a picnic and relax when your done. Thanks for sharing. What a beautiful place for a walk and some great photography! I love when you can find places of quiet and solitude right outside big cities! As a lover of small towns, the hustle and bustle of the city can wear me down easily. Love this insider tip as it sounds like it would be a great way to balance out the fun of the city and peacefulness. I would have never have thought there were so many beautiful green walking trails in Paris. Your photos are lovely.